Drift off into relaxation with the calming, fresh scent of our Island Cotton Bath Salts. As you soak in the tub you'll soon feel as if you're on vacation, lying on a quiet beach with a clean and fresh breeze surrounding you. 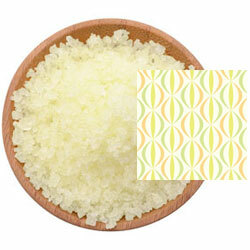 A fine/medium grain blend of Pacific Sea Salt with the fresh scent of island cotton in a light yellow color.